I love the idea of maxing out a small space beautifully, for one it makes the space feel grander but it also reinforces the idea that your home needn’t be enormous to look fabulous and function well! Designer and stylist Lizzie Carney’s 1,000 sq. foot bungalow does just this! 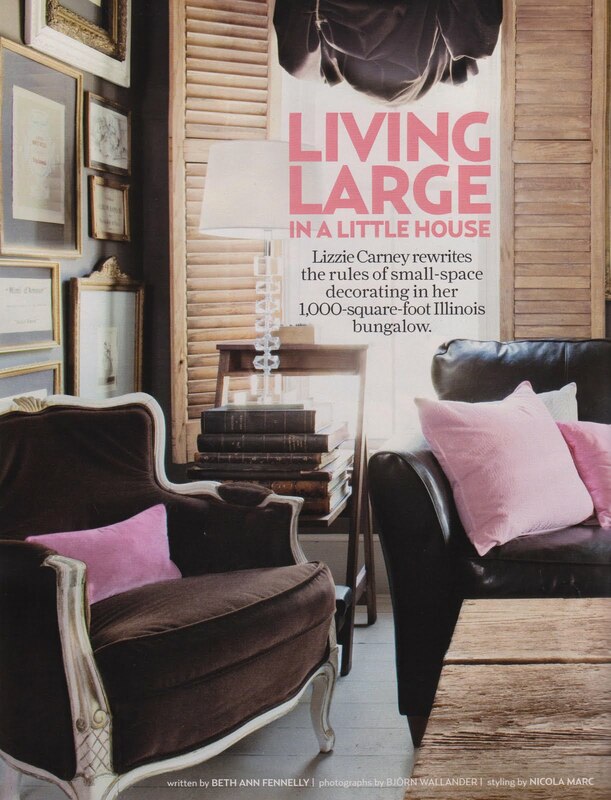 Lizzie painted the entire home a custom charcoal color to unify her home! 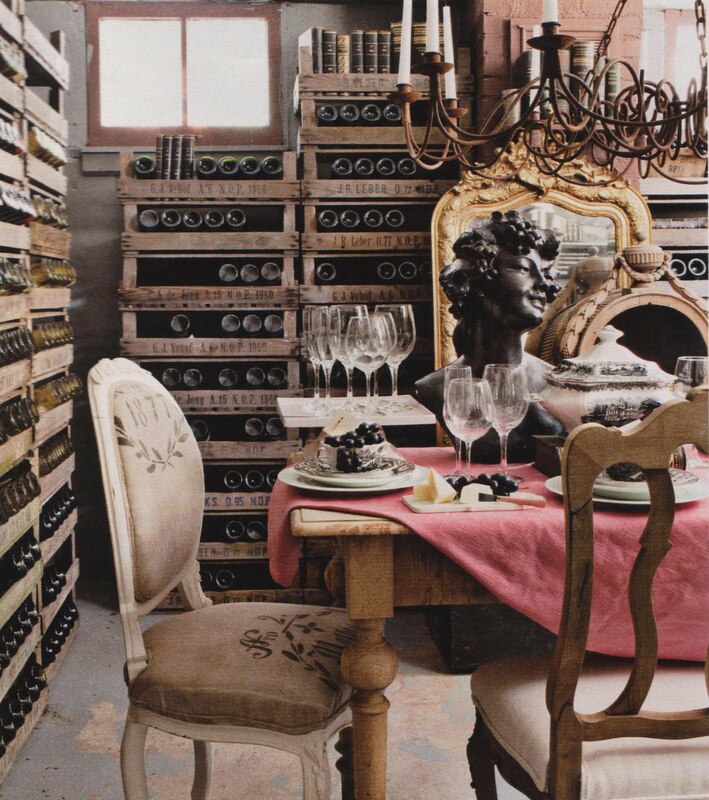 She also infused the space with found objects and gorgeous European antiques. Unique items add interest and depth to any home! Lizzie turned her basement into a wine cellar! 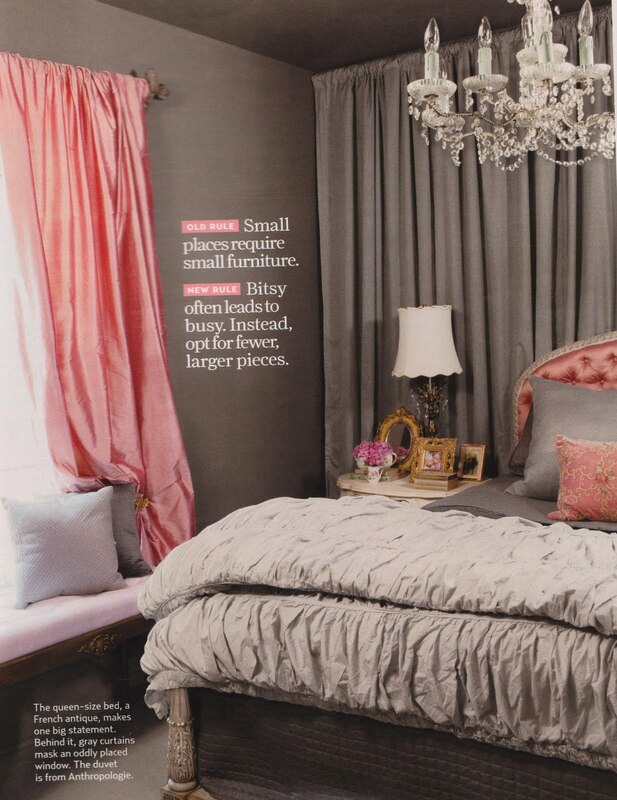 Lizzie outfitted a small bedroom as a dressing room! A vintage rolling rack houses her hanging clothing. I spotted a vintage shoe rack at the Todd Farm flea market yesterday. If it’s there next week, I may have to grab it! Lizzie works for design/import firm Euro Trash, check out their site for more European and vintage finds..
great post! I love the wine cellar and the "closet"! great use of space… ALL of it! wow, my jaw dropped lower and lower with every picture. wine cellar and dressing room? I will move right in! I LOVE this home so much! The colors are so great! My dream is to have a dressing room…how fun! I love this home. It looks so cozy and lived in. I love her use of space and I am sure she has a tone of great hidden storage! I love that duvet and miss Anthropologie every day ! I have a small oddly shaped kitchen that I am about to start to work on .. it is almost perfect but needs a touch here and there.. 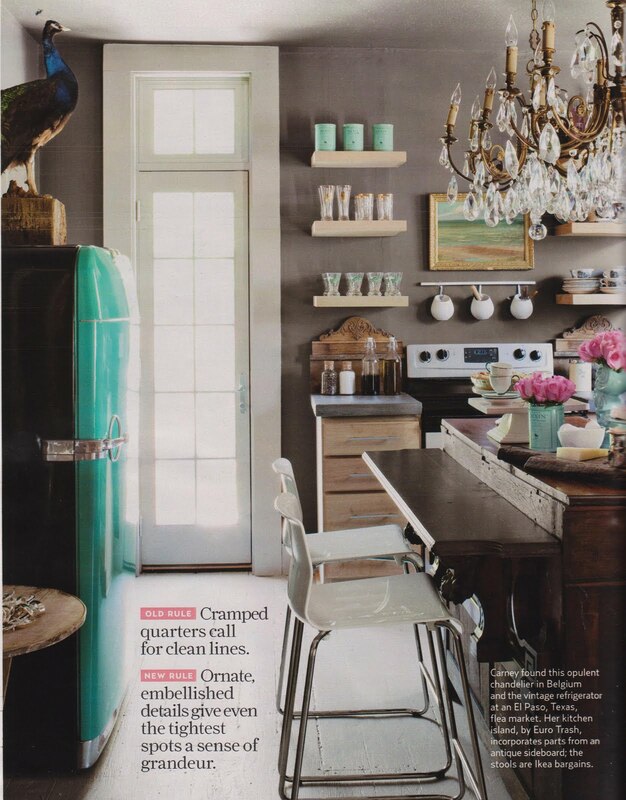 I love the floating shelves in the kitchen..above. SO true… the *in a nutshell*-part! Thank you for sharing, very nice job Lizzie has done, I particulary love the wince cellar, what a clever idea! imagine a wonderful candle light dinner down there…. Amazing pictures, I especially like the colour scheme! Living in Europe (Sweden) myself, I do recognize many European objects (and some IKEA too). Love the mix! She truly did a beautiful job! Wow…her place is amazing!!!! I love every square inch. A very inspiring way to use up space indeed!!! I adore this house…so charming!! Love this post. I was shocked to see the magazine it was from. Very current wall color too! Julie thank you for posting Lizzie's amazing home. I think a good testament to great design is perfecting a small space. That is a true design challenge. This is (hopefully) where I'm headed next. Small is better is going to be our new motto. Lizzie's kitchen I could just move my bed into & live there! fantastic. that gray is awesome. and all that from Country Living? Who knew…? I really need to get my subscription to this mag. I am absolutely loving that coral and gray! Wow I want to move in! I love the basement cellar idea! I am in love with this home. Especially the wine cellar in the basement, the bedroom, and the closet. I blogged about it today I love it so much! Thanks for sharing.